While cinnamon raisin bread is pretty awesome, sometimes you just want a change. 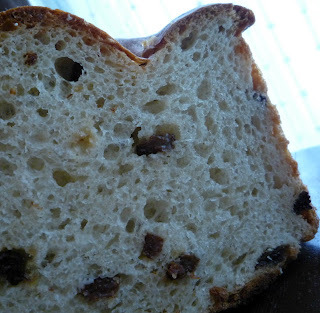 This loaf is light, sweet and full of raisins. A contrast to it's somewhat heavier, spiced cousin. Sadly, this bread ended up a little (alright, who am I kidding - a LOT) over proofed, but whatevas it was still pretty tasty! Knead. Cover and let rise 1 hour. Shape into 2 loaf pans. Rise 45 minutes. Bake 350 for 40 minutes.